This is such a simple, uncomplicated, warming, economical and nourishing dish. Loads of fresh herbs lift its earthy notes. Heat a small amount of oil in a large pan. Alternatively just use a little water and sauté the onion until softened. Add the garlic and cook on a gentle heat for another minute or two. Add the crushed chopped tomatoes, harissa paste and maple syrup. Stir to combine and simmer gently for 10 minutes. Add the beans. Stir through the parsley and coriander. Bring everything to the boil. Check the seasoning. Add some chilli flakes if you want more heat. Serving suggestion: This is lovely served with cous cous, steamed maple carrots, loads of salad dressed in fresh lime juice and olive oil. Fresh bread to mop up all the juices is also a great accompaniment. Notes: Harissa paste is available in well stocked delis. 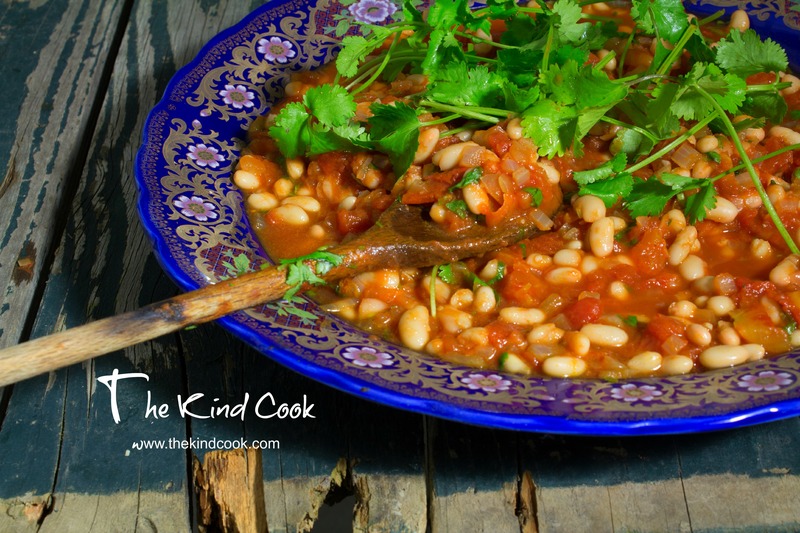 I often also add a generous handful of good quality Kalamata olives to this dish, when I add the beans. If you have left overs, this is delicious on toast the next day.